Stretch has a passion in his performance that sets shows alight. From dark-hearted ballads to roof-raising choruses, his songs are a bittersweet blend of folk, soul, country and rock’n’roll. Having sold out concerts at Church Road Winery and Hawke's Bay Arts Festival, performed stunning sets at The Powerstation and Tuning Fork, opened for the likes of Damien Rice and Jeff Tweedy; Stretch can be counted as one of New Zealand's finest and most captivating musical talents. 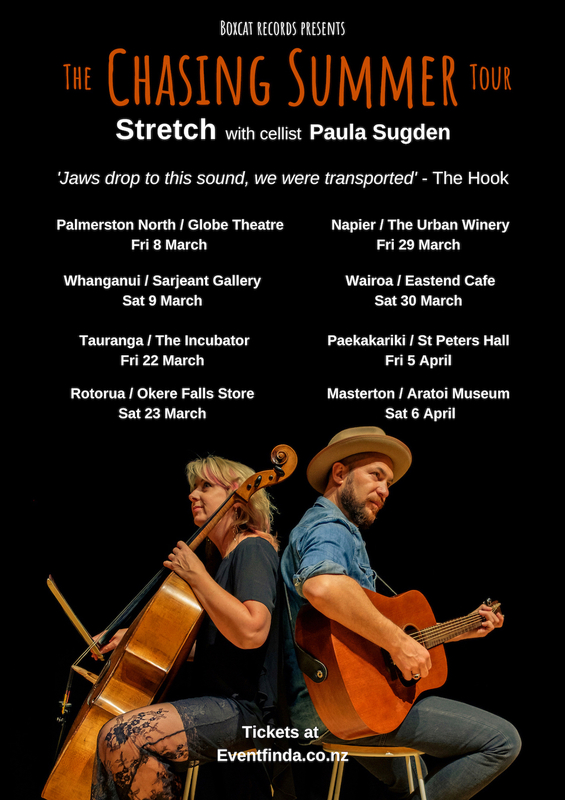 Touring their enthralling combination of soulful song-writing and soaring cello, The Chasing Summer Tour runs from March through April across New Zealand. A mission of connection sets Stretch truly apart, earning him a reputation as an artist with the rare ability to create a bond with every audience he gets in front of. With this, The Chasing Summer Tour presents a stunning night of music and emotion.